PO3:Design /Development of solutions: Design solutions for complex engineering problems and design system components or processes that meet the specified needs with appropriate consideration for the public health and safety, and the cultural, societal, and environmental considerations. The Department of Electrical and Electronics Engineering was established in the year 2012. It offers an UG Course namely B.E Electrical and Electronics Engineering with a Sanctioned intake of 60. The department is instituted with a vision to meet the world’s sky-rocketing demand for electricity. It deals with the study and application of Electricity, Electronics and Electro Magnetism. These are the areas of development which have created wonders and are most important without which, the world will not move on. Students are given awareness in the area of control system which plays an important part in modern equipments which are automatically controlled. Students are also made to be aware of different types of fault analysis, stability analysis and corrective measures in power system. So we can say that Electrical and Electronics course provides a student with full knowledge of Electrical and Electronics field. The Electrical and Electronics Engineering degree program prepares graduates to enter a dynamic and rapidly changing field with career opportunities in Electric power, Integrated circuits, Robotics and control, Computer hardware and software. The demand for Electrical Power is increasing rapidly and thereby Electrical Engineers are in great demand to meet the requirements. Our campus is an exciting place to study and grow where thinkers become leaders, where there is a thirst for knowledge. The interaction between students and professors greatly enriches the educational experience for all. Our campus provides students with opportunities to gain and use knowledge to build successful lives and career and become an integral part of the community. The department laboratories are well-equipped and commensurate with licensed software such as MATLAB and ETAP for solving analyzing power system problems. The department has adequate infrastructure to do research in Power Systems. Our faculty members are experts in the areas they teach. Not only do they provide a solid grounding in the academic theories and concepts of their specialty but they also provide challenges for the students, facing their discipline. They provide the students the right balance of theory and practice. We emphasize team work to give opportunity to each student to benefit from the ideas and intelligence of their classmates. We continue to strive to meet our mission to mould youth into world-class technocrats of tomorrow who would endeavor to increase the quality of life for mankind. I am confident that our students would be an asset to our organization with their technical and managerial capabilities. On the whole, we are committed towards creating and erecting a professional graduate community which is vivacious with continuous learning. 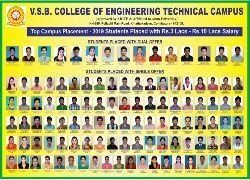 Electrical and Electronics Engineers have career opportunities in Electrical power generation, Integrated circuits, Manufacturing of Robotics and control, Computer Hardware & Software, Manufacturing of Electrical & Electronics Equipment’s, Electrical Energy saving equipment’s, Non-conventional sources of energy conversion systems, etc.